Audrey Yvonne Singletary was born May 8,1947 in Jacksonville, Florida to George and the late Carrie Gaskin. Audrey attended schools in Jacksonville, Florida. She worked for many years with special needs and mentally challenged adults and children. Audrey was proceeded in death by her mother, Carrie Gaskin; grandson, George Harris III; great granddaughter, Shaquana Dissie Mobley. She is survived by her children, Dissie Wright, Lovern Brown (Victor), Tressia Harris (George), Bertha Goodman; 10 grandchildren; 7 great grandchildren; father, George Gaskin, Sr.; brothers, George Gaskin, Jr. (Gwendolyn), Gregory Gaskin, Edward Gaskin, Donald Gaskin (Cristol); sisters, Leveen Richardson (Vernon), Victoria Young (James); special friend, Jerry Phillips; a host of nephews, nieces, family and friends. 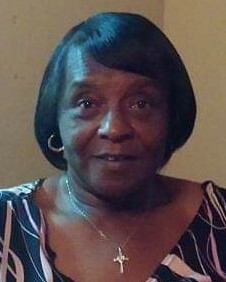 Celebration of Life Service for Audrey Yvonne Singletary will be 11:00 AM Saturday, February 16, 2019 at The Soutel Chapel. Family will receive friends Friday from 4 – 5 PM at The Soutel Chapel. Interment at Restlawn Memorial Park. Because of the love of her family, arrangement entrusted to J. E. Fralin & Funeral & Cremation Services, 5065 Soutel Dr,904.924.9400.